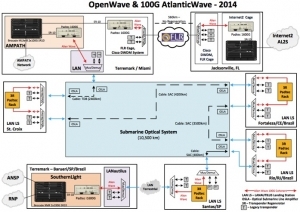 OpenWave, a project under the NSF IRNC AmLight ProNet Award, is deploying an unprecedented experimental 100G of interconnectivity between the U.S, and Brazil. The OpenWave experiment’s intellectual merit is a breakthough undertaking of a single 5600 km submarine link using a 100G wave. AmLight OpenWave utilizes optical hardware that has never before been commercially deployed underwater at this distance. 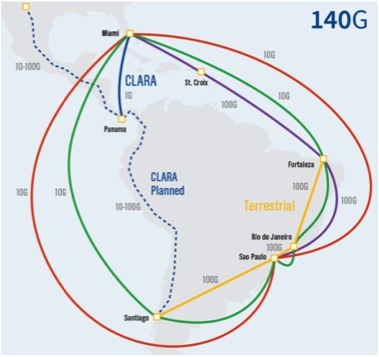 The 100G will be first on a wave between St. Croix, USVI, and Fortaleza, Brazil, then Miami to St. Croix and Fortaleza to São Paulo. AmLight will experimentally deploy the OpenWave 100G of interconnectivity with industry partners and then develop the infrastructure to ensure the bandwidth is effectively integrated into the fabric of AmLight – enabling the frontier of science today. Undersea telecommunications facilities connecting the U.S. to Brazil are constrained. To date, there are three oversubscribed undersea fiber optic cable systems in service between the U.S. and Brazil. All pairs are in use. All have extreme saturation near the blue end of the optical spectrum due to the legacy load of waves established over four years of growth. OpenWave’s objective is to discover and implement how a 100G trans-oceanic wave can be deployed and tested on a highly constrained undersea fiber optic cable system without impacting production services. 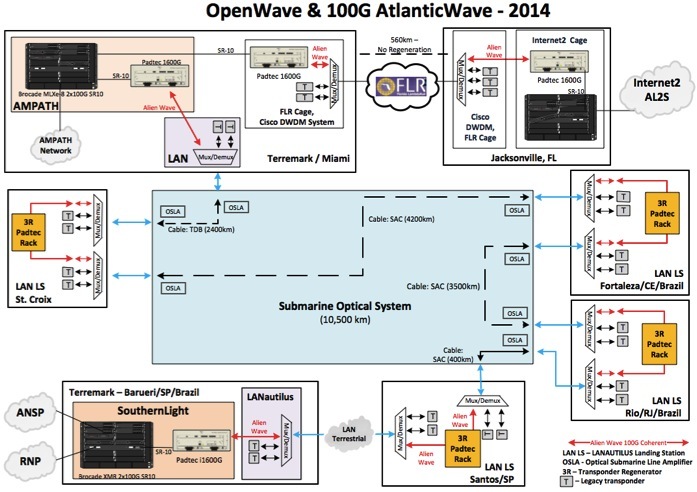 Leveraging AmLight’s long-standing research and education networking and industry partnerships, the OpenWave experiment sets out to test a 100G alien wave end-to-end from São Paulo to Miami. First, a 6-month trial is being conducted in the laboratory to determine through experimentation the feasibility of 100G transport between the U.S. and Brazil. Then, after the trial tests of the optical technology OpenWave will be deployed on industry partner Latin American Nautilus’ available spectrum on a production transoceanic cable system via an alien wave. OpenWave’s broader impacts are to determine how to operate 100G at 5600 km effectively between North and South America to bring a new resource to science and education and transfer the understating of a new technology to the commercial space. AmLight’s OpenWave provides a never before opportunity for U.S. computer science and engineering graduate students to be in on the ground floor of international technology innovation. The end result will be enabling a future of submarine connectivity towards available rate parity with terrestrial infrastructure. This network resource will foster a far reaching and trans-domain research and education enablement throughout the Western Hemisphere.